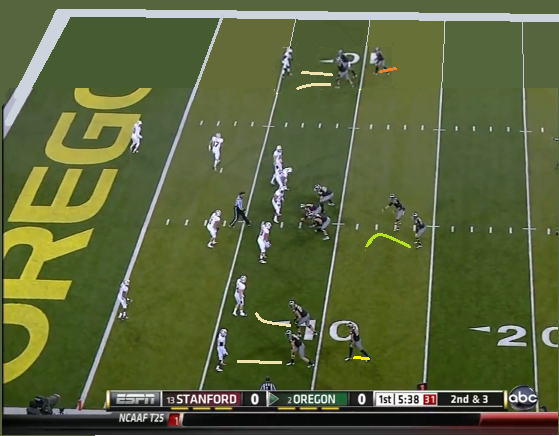 Both plays appear to be the same run-pass option play that Sheil Kapadia explained marvelously here. Since we know the play is executed as an inside zone run or a quick pass depending on how the defense lines up, splitting the tackles appears to be a wrinkle employed to increase numbers on the outside. And the split RT did create a numbers advantage when both OTs were split wide. 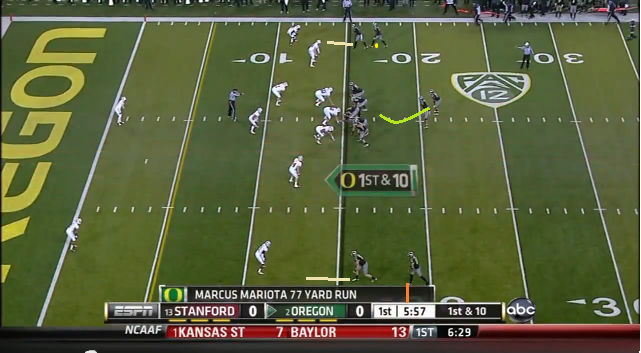 Marcus Mariota immediately threw to De’Anthony Thomas who had two blockers (including an OT!) to seal off any defenders (there was only one here, with two more on the way) between him and the end zone. He made it to the end zone, though the score didn’t count since he had dropped to a knee to make the catch. On the play run prior to the split OTs play, the numbers favored a quick pass to the right to WR Will Murphy (currently with the Eagles). I’m a huge fan of these kind of wrinkles. Stanford was not prepared to account for two lead blockers on the right side, and with Oregon’s tempo (12 seconds from whistle to snap), they didn’t have time to figure it out.